Well known for their innovative and character-driven indie titles, Twisted Pixel Games is back on the Xbox market with their ambitious Xbox One launch title, LocoCycle. When I first heard the title ‘LocoCycle’ during the E3 announcements, I thought the game resembled a crazier version of Happy Wheels (don’t pretend like you haven’t played it at least once). Twisted Pixel Games takes both previous and next-gen players into a quirky extreme of entertainment; where the assassin motorcycle controls the Mexican mechanic. So let’s determine whether this outrageous adventure embraces a wild ride or crashes into a dead end. The story begins with an absurd live-action sequence, featuring the Chairman of Big Arms (James Gunn) celebrating the creation of two strategic AI motor vehicles with potential buyers. Here we are introduced to I.R.I.S. (Lisa Foiles) and her to-be-nemesis, S.P.I.K.E. (Robert Patrick); both sophisticated and armoured fighting motorcycles. When a storm breaks out and lightning strikes I.R.I.S, she is taken by a bodyguard to a mechanical shop for service. The Mexican, Pablo (Freddy Rodriguez) is assigned to take care of the motorcycle, and starts sweet talking to I.R.I.S. during repair; “Vamos a ver lo que está pasando en el bebé”; only to become dumbfounded by her ability to speak and understand him (and every other language that exists in the human race). I.R.I.S. tunes into a television advertisement in the shop for the Freedom Rally in Scottsburg, Indiana and forces Pablo to help her escape, by dragging him along for the ride. As LocoCycle progresses, the story is framed through drawn-out full motion videos, revolving around the Government Agency trying to pinpoint the motorcycle’s destination by utilising S.P.I.K.E (unsurprisingly) and activating the mysterious project. As for the live-action footage, it was unclear as to how relevant each of the cut scenes were in storytelling and keeping the audience engaged. Players have the option of watching the film within the game, although the dry sense of humour throughout LocoCycle would convince them otherwise. LocoCycle is built into a short singleplayer campaign and provides players with the option to go through different missions at their own pace, none of which has a level of difficulty to choose from. Players will find that the gameplay is relatively simple, quick to learn and tedious, based on the insane amount of repetition carried throughout the game. After the first, of five chapters (each with three parts), it became apparent that the gameplay style was reiterated throughout and ironically, does not offer players the room to move outside the boundaries of the game. 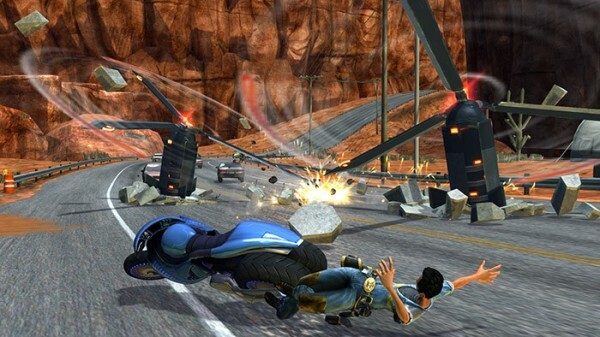 Players are constantly pushed forward on the road; dodging and/or destroying obstacles (vehicles, road blocks, explosives, armed agents), quick-timed events for bonus points and engaging in endless combat against agents and different types of outlandish bosses; Big Science Balls, Cruisin Bomber, Agent Vel-Fro, S.P.I.K.E. and many more. It was frustrating having to go through the same type of enemy wave in each level; especially considering there were no specified check-points to save the game. Nevertheless, the most impressive aspect of the gameplay is the fast-paced martial arts fighting style; combining the combo attack damage of both Pablo and I.R.I.S. by using the variety of skills, such as flame mode, earned through melee and combat technique upgrades. I thought it was handy to provide players with an upgrade system after completing missions, allowing them to spend their HP on various fire weapons and boosting health and turbo, for the motorcycle and her companion. I thought the appraisal – BEARDED, APOCALYPTIC, MINDBLOWING – for excellent hit combos, worked well as an incentive for players to do their best. Additionally, players are rated based on kills, accuracy, best combo percentage and overall grade. The purpose of this rating system is directly related to the leaderboard, for players to compare their overall scores. However, I found the achievements for exceptional performance in different levels to be more rewarding, including, ‘Back in Yo Face’, ‘Conquered Canyons’ and ‘Adio Mexico’. On a visual spectrum, LocoCycle uses a vibrant art and cartoonish style, that better suits the graphics quality for an Xbox 360, rather than the Xbox One. For a game that focused on travelling a great length, it was disappointing to see nothing beyond the mundane and very basic scenery through the highway, snow tracks, waterways and farmlands. The camera switching that followed I.R.I.S. and Pablo and their next human or environmental hazard was visually disorienting, particularly during combat. If Twisted Pixel spent more time on in-game visuals, than live-action footage between levels, the visual experience would be more rewarding for players. The highlight of LocoCycle was the original music score and lead audio, conducted by Matt Chaney, a.k.a. “CHAINSAW” and the orchestration, assembled by Donald Grantham. The fast-paced and endearing soundtrack differed from Twisted Pixel’s trademark silly tracks, by taking a more serious approach to the in-game atmosphere. However, the downside was having to listen to the painful and ongoing dialogue between I.R.I.S and the wailing Mexican. 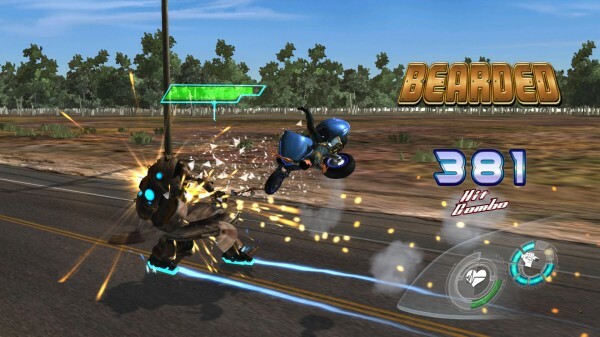 Of course, players have the option to turn off the voice through settings and use subtitles instead, but it’s harder to follow the motorcycle’s objectives that way. 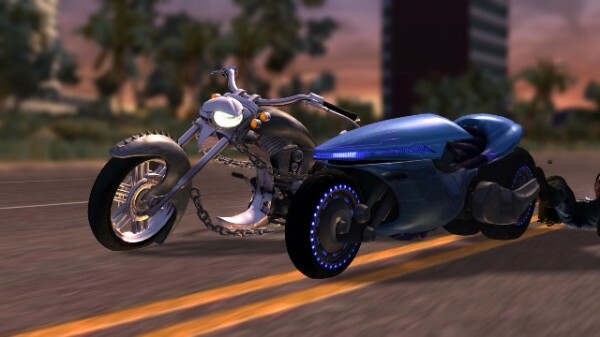 LocoCycle is not your average racing game, instead Twisted Pixel Games delivers players with an action packed fighting game with two unlikely characters; a Mexican mechanic and rogue motorcycle. 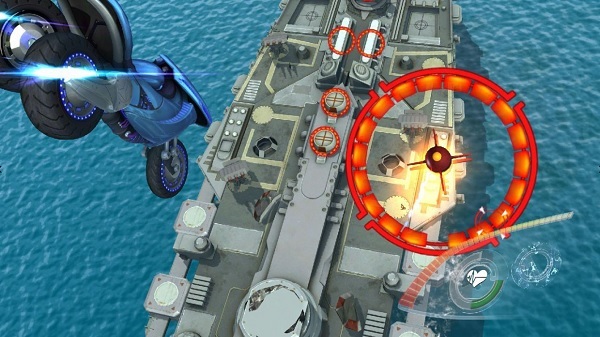 Although the original idea is far-fetched, especially for an Xbox One launch title, it was the repetitive gameplay that triggered the downfall of LocoCycle. The game did not excel into a wild ride nor crash into a dead end, but the execution was definitely not up to the high standards for next gen consoles. I was disappointed that I could not entirely control I.R.I.S. and Pablo and make my own decisions in-game; rather I was limited to following the set path of the motorcycle to Scottsburg, Indiana. 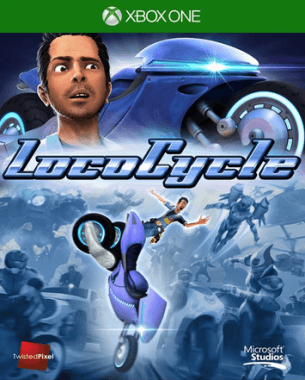 That being said, LocoCycle is a decent game that deserves a test-ride, whether that be on Xbox 360 or Xbox One is up to the players.